You will see this chart pattern ALL the time. It took all of about 5 minutes to run a scan and find an example for this page! Learn it. It is one of the most reliable patterns I know of. You'll see why in a second. Like the name implies, this chart pattern "traps" swing traders (and momentum traders) right in the middle of a move. In Elliott Wave theory this pattern is known as an A-B-C pattern - just on a smaller scale. I call them "swing traps" because it's a lot more descriptive! The circled area is what we are interested in. That is what you want to look for when you are running your scans. It is very easy to identify this pattern. You'll recognize it in a second! This stock rallies hard to $42.00 (see chart). It then pulls back real nicely into the TAZ. This would have been a nice pullback to trade. But look at what happens next. It rallies up a little bit, but then it fails and goes right back down. This traps the swing traders who are long this stock. They put their stop loss orders under the first rally attempt. But, when the stock fell, it took out their stop loss orders. Now that the majority of sellers are out of the trade, the stock can rally. 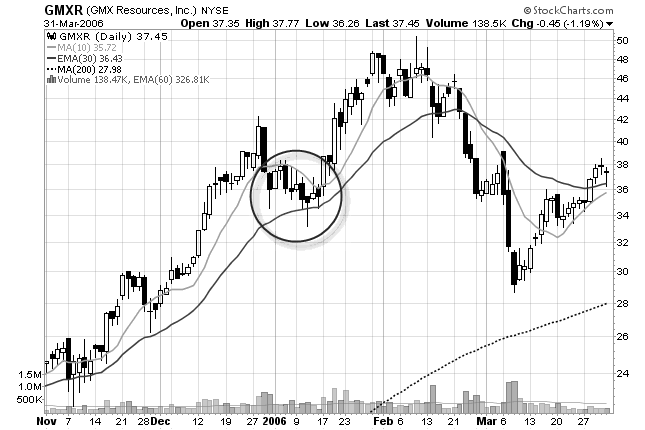 The key with this chart pattern is to look for the "shakeout". The final swing MUST go below the low of the first swing. Many times, this final swing will end in a hammer. This hammer will take out all of the stop loss orders and you are ready to go! Wait for a candlestick pattern to develop on the final swing (in this case, it was a hammer). Then you can buy the stock on the day of the pattern, or wait, put in a buy stop above the high of the candlestick pattern. It's up to you how you want to enter the stock. Nothing special here. Just put your stop where it makes the most sense. Usually this will be under the low of the day of entry, but look to the left on the chart to identify support and resistance levels. On the exit strategy page, you will find several options for trailing your stops. If the stock is entering into a stage two cycle, then I will usually want to give the stock a little room. In this case I would just trail my stops off of the weekly chart (a trend trade versus a swing trade). The secret to this pattern is for the final swing to go below the low of the first swing. This is crucial. You will find this exact pattern on the short side also. The pattern is just reversed. This pattern is not limited to the daily chart. You will see it in all time frames. Your going to love trading this chart pattern. It represents a short term extreme in the market that gets a lot of potential sellers out of the stock before you get in!